Click the buy button above to complete the ordering process, then upload a photo of child "facing forward." 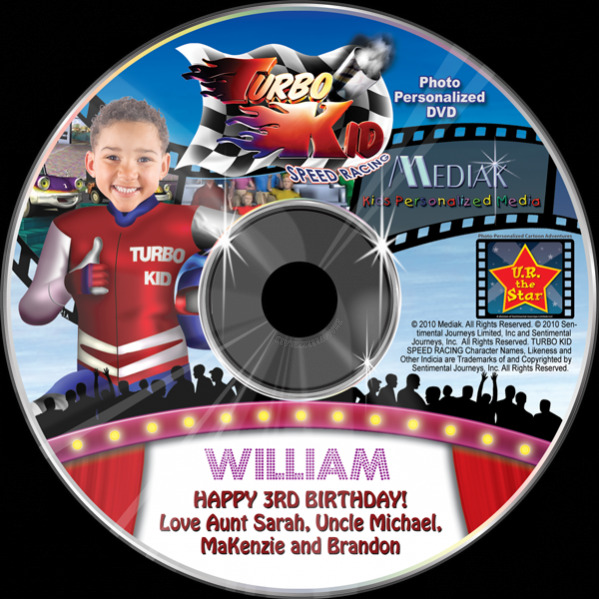 This Mediak photo personalized video has 10 action-packed chapters with your child taking the leading role as Turbo Kid the Speed Racer! The child’s picture is used in 40 scenes, or about 80% of the playtime. Start your engines! Jump in the driver’s seat and take the lead as “Turbo Kid” in this race to the finish. Acceleration and total control is the key to Blaster’s defeat.|“Turbo Kid Speed Racing” is a photo-personalized DVD that allows your child to engage in extreme sports and high speeds as the onscreen star. It’s the ultimate adrenaline rush. Your child will make laps around the track and compete against other drivers for the championship title.|This DVD encourages healthy competition, thrilling motivation and extreme fun.